Hormonal changes, a high-calorie diet and decreased activity causes weight gain in senior women. Weight gain also seems to shift, away from other problem areas, like the hips and legs, and to the midsection. Fortunately, a few lifestyle changes can promote weight loss and help you maintain a healthy weight. 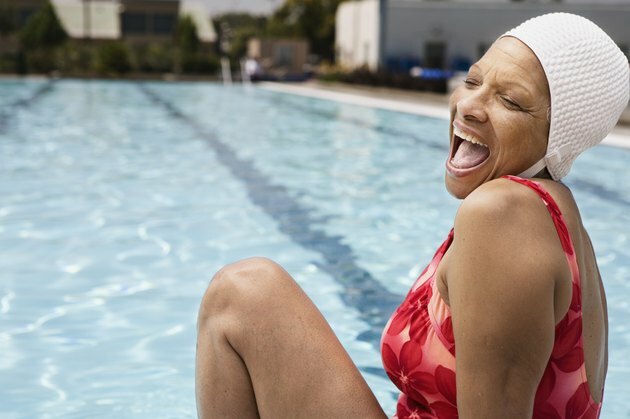 Older women in good health need at least 150 minutes of physical activity weekly, according to the Centers for Disease Control and Prevention. Another option is one 75 minutes of vigorous aerobic activity weekly. Use a scale of 1 to 10 to judge your activity level, with 10 as the most vigorous activity. For moderate activity, you are at a 5 or 6 and can still talk or sing a song. Vigorous activity is a 7 or 8 on the intensity scale; your heart rate is high and you aren't able to talk more than a few words. Always check with your doctor before starting a new fitness program. You also need strength training activities at least two days a week, according to the Centers for Disease Control and Prevention. Strength training will prevent you from losing muscle as you age. Get the full benefit of strength training by completing eight to 12 repetitions until it's difficult to complete a repetition without getting help. Lifting weights, resistance bands, heavy gardening or yoga are examples of strength training activities for older women. As you age, your metabolism slows down. This causes weight gain in women. Fight weight gain by using a reduced-calorie diet. Diet requirements will vary by height and weight, however. MayoClinic.com offers its Healthy Pyramid Tool, allowing women to calculate daily calorie and food serving requirements. As a general rule, you need to consume fruits, vegetables and whole grain carbohydrates. Lean protein sources, like nuts and fresh water fish, are also eaten. Fats are consumed in moderation, however, should come from healthy sources, like olive oil. As women get older, belly fat is a common problem. Consuming monounsaturated fats can combat this problem by increasing your basal metabolic rate. Foods rich in this type of fat include avocados, almonds and peanuts. Vegetable-based oils, like canola oil and olive oil, are a few other options. Supplement high-fat foods, like butter, with these healthy options for increased fat loss.